man oh man — this one is an absolute gem. 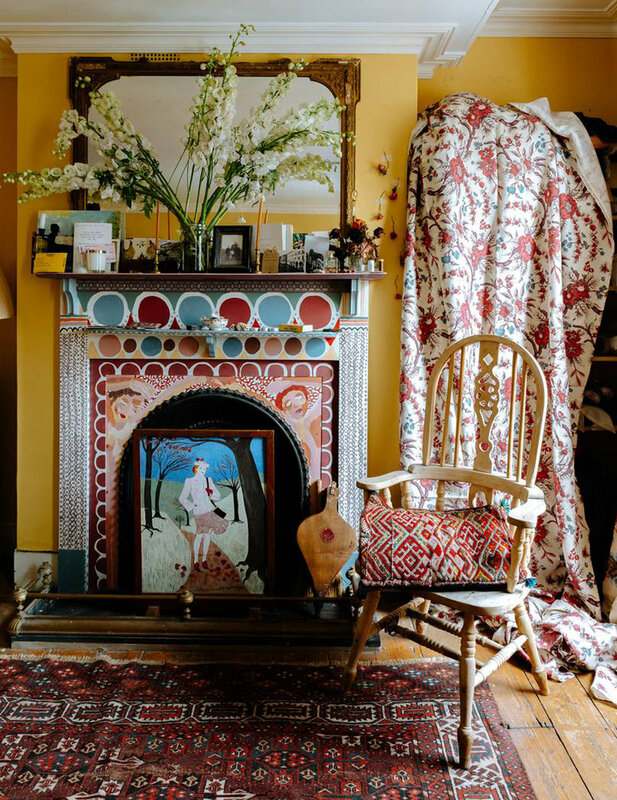 say hello to this vibrant setting: home to london based stylist, maude smith, and a flawless representation of my dream cottage. there’s so much goodness going on here! 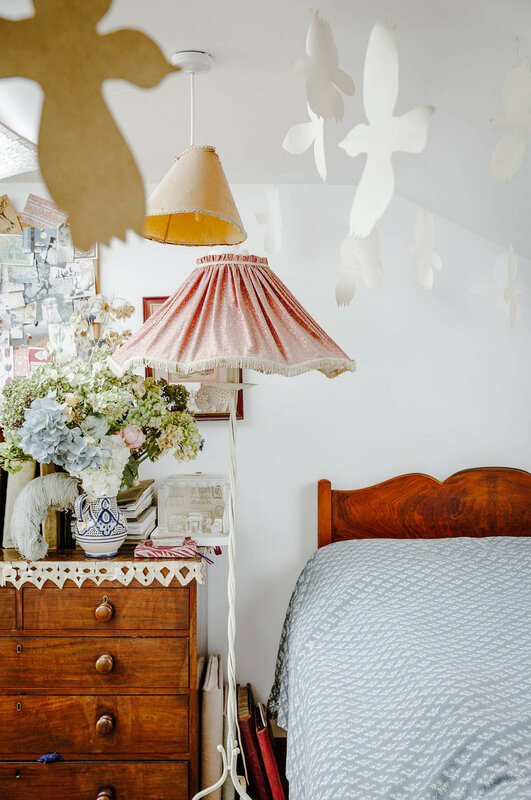 persian rugs, paper birds flying from a bedroom ceiling, strong wooden furniture, worn in floral armchairs, and wacky kitchen cabinets covered in seashells and wine corks — it’s all tucked inside this cozy townhouse. the bathroom’s hand painted tile is definitely my favorite part of the house. seriously, i found myself googling where to buy bug tiles because they’re incredible. i love that each tile is a little different and imperfect, and that maude chose to pair them with vintage fixtures in mixed metals. i’m also obsessed with the rich colors — burgundy, gold, royal and eggshell blue — paired with flashes of hand drawn wallpaper and murals. what a cool backdrop for displaying this colorful collection. 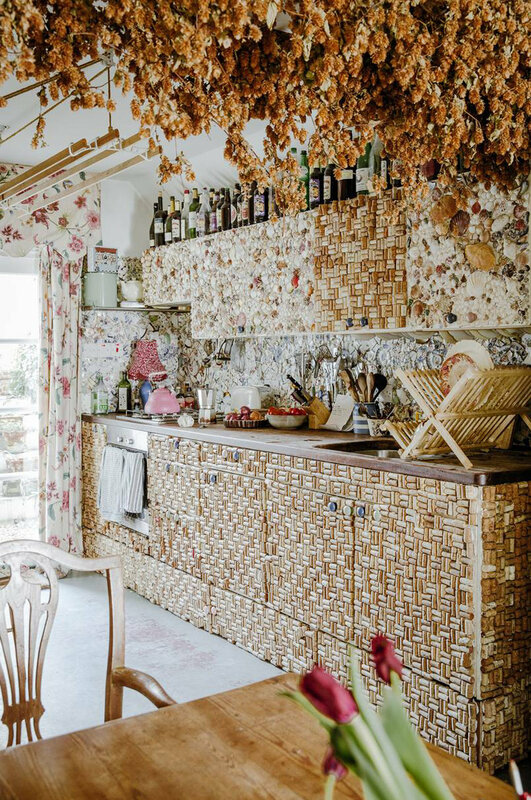 smith’s kitchen is an amazing mishmash of corks, seashells, broken china, dried flowers and empty wine bottles. a diy that totally works and (let’s be honest) offers a strong argument for installing seashell cabinets. who knew! just another sweet corner in the sweetest house. wasn’t this home the cutest? i would probably end my days here reading a book in this floral armchair. 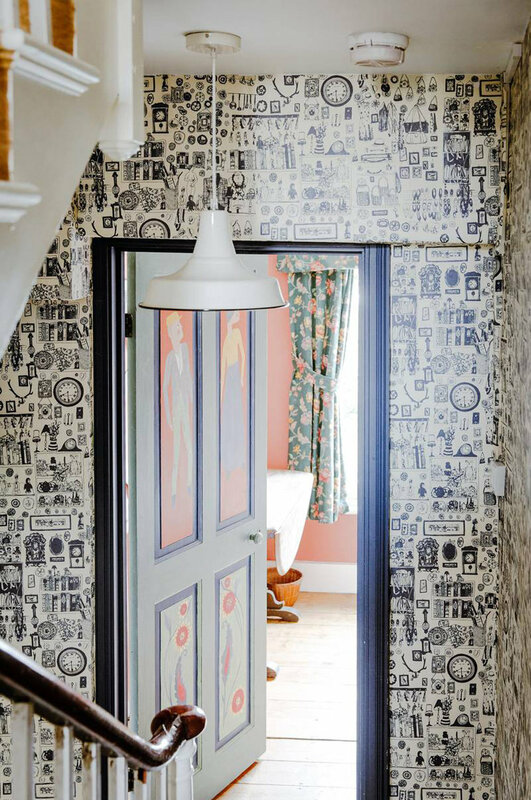 i love spaces that use every inch to display memories found along the way, and maude smith’s home does not disappoint. glad i stumbled upon this treasure! i recently replaced a pair of old, hand-me-down sofas with two new mid-century pieces that i found for an amazing deal. (a really amazing deal). they completely transformed the space and it feels so good! i still need a few more pieces to really tie the room together -- including a new coffee table, rug and tv stand, plus important accessories like pillows and blankets. i'm also toying with the idea of adding a funky accent chair for additional seating and for added interest. i want something that will really stand out. as usual, i started browsing options that are really out of my price range. but what i found was too good not to share: i would do anything to own the floral armchair that is beaded by hand and takes over three months to make. wouldn't you?! it's amazing. there's something so sweet about this resort collection by Giorgio Armani's protégé, Stella Jean. the monkey print reminds me of those plastic hanging monkeys us 90s kids played with, and the handpainted ducks are reminiscent of nursery rhymes. with a whimsical sense of humor, Stella Jean's designs are a breath of fresh air -- just check out her other collections, my favorites being Spring 2016 RTW and Resort 2017. beyond the whimsical prints, i especially love the layering and styling choices: cool slides, delicate everyday earrings and plenty of great pattern mixing moments (many of which include a bold stripe). there is something to be said about a perfectly coordinated couple about town, and aren't these four the cutest? with Valentine's Day right around the corner, it's the perfect excuse to dive into some street style and find inspiration from real life lovebirds. this, my friends, is exactly what i want to wear on those 100 degree days. we've had a solid month of 90+ weather here in Boston, and with more hot days on the horizon i've pretty much exhausted my trusty collection of summer dresses. it's come to the point where i wear the same thing every week. (yes, i have a wednesday dress). so to make my life a little less predictable, i've been building a wishlist of summer frocks -- including this awesome patterned shift. the simple shape is ideal for the hottest of days, and the print is fun and tropical. i'd wear it with really simple accessories: mules, sunglasses and a round raffia bag. ahhhhh the world that Gucci lives in. i'm about ready to crawl inside their universe where cat sweaters, berets, and ankle strap heels are the uniform of life. i, for one, am a huge fan of the designs that are coming out of the House of Gucci as of late. which brings me back to this post, and why i am sharing this collection with you. i think it's safe to say this: the 1970s are having a moment. and frankly, i really dig it. the now-ubiquitous embroidered jacket, bold primary colors, even flared jeans are all back, and feeling as fresh and exciting as ever. Gucci's newest designs (first found on Pinterest, of course) are what a 70s revival should look like: 1970s vibes but mixed with French cool-girl, and a little crazy cat lady. i was really inspired by these pieces and how they were styled. i hope you are too. enjoy! great pastel colors in this eyeball print poster. the polka dot cutting board: the random cooking accessory i didn't know i really needed. maybe the perfect black flats? also: the lovely blush lining. the specked outside of this mug reminds me of using the blue enamel camping cups from fall trips. a geometric cut-out tee in the perfect boyfriend shape. this furry eye-balled creature bag. black and gold? or purple?